A group of six female protesters from Greenpeace were arrested on suspicion of aggravated trespass after scaling London’s 72-storey Shard tower on Thursday. The group of female activists climbed all day and reached the top of the Shard in central London at around 7pm on Thursday night after 15 hours of climbing in protest at oil drilling in the Arctic. After reaching the summit of the 72-storey building, two of the campaigners unfurled a huge flag with “Save the Arctic” written in white across it. Greenpeace posted pictures at 7:30am of a group of female protesters, and said the team had started climbing at 4am. It named the group as “Sabine, Sandra, Victo, Ali, Wiola and Liesbeth”, adding: “Wish them luck, they’re awesome”. You can watch the climb here. 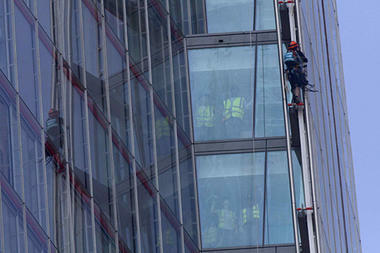 This entry was posted in Arctic drilling, Climate change, Environment and tagged Greenpeace, Save the Arctic, The Shard. Bookmark the permalink.